Huntington’s Disease, which is also known as HD, slowly deteriorates a person’s physical and cognitive abilities. The cognitive decline includes a loss of short-term memory, decision-making, concentration, among other things. But the worst part about the disease is that there is no cure. Once the symptoms start, the average life span is 10-20 years. I first learned about HD at the age of 15 when my mom was officially diagnosed with it. My family and I knew my mom had it because of her poor balance, wobbly movements, often tripping and falling over, as if she were drunk. She also had these severe mood swings where one minute she was fine and the next, she was angry, frustrated, or depressed. Yet, as a 15-year-old, I was too focused on today and trying to live a “normal” life to worry about my future. I did not want anything to do with HD, realizing I was in denial and often embarrassed by my mom’s slurred speech and wobbly movements. It was not until college that I understood the genetic component of HD affected me as well - I was at a 50/50 chance of inheriting the disease and ending up just like my mom. A simple coin-flip. I thought: heads I win, tails I lose. I just didn’t know which it was going to be, because to know you need a genetic test. As a college freshman, I knew I was not ready to take this test, but I couldn’t help thinking about it because of the impact it would have on my future. What happens if I test positive? Do I still get married and have kids? Do I follow a different career path that involves a lot of money? And if I am negative? Will I have the “survivors guilt” and then be worried that my older sister may end up with the disease? It was mentally draining on a daily basis and I ultimately decided I did not want to live with the unknown, so I got tested. As 20-year-old college sophomore, I found out that I tested positive for Huntington’s Disease and will slowly deteriorate, both physically and mentally, just like my mom. When finding the results out, I decided to only tell a few friends and did not tell my family. My mom was still alive, and I knew she would feel terribly guilty about passing this disease onto her son. She was already suffering enough and I did not want her to feel at fault for passing this terrible disease down to her son. 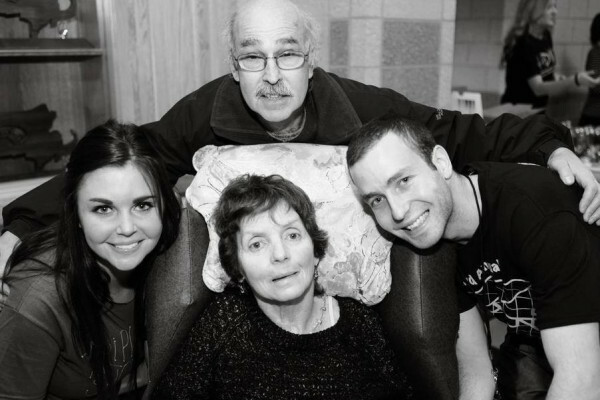 My dad was the caregiver for my mom and I didn’t want to feel like another burden to him. And since HD is a genetic disease, my older sister is also at risk and I did not want her to feel stressed or pressured to get tested. I decided to use my positive test results as motivation and decided to get even more involved in the HD community. I joined several HD organizations who support families and young people impacted by the disease. I became the President of these HD organizations and was doing as much as I could to raise money and awareness for the disease. I had nothing to worry about because everyone thought I was doing all of this because of my mom. There have been some great research strides since the Huntington gene was officially discovered in 1993. There are many clinical trials happening around the world, with the most recent one discovering a spinal injection of a drug to not only be safe in humans, but also lowering the Huntingtin protein by about 40-50%. Although this trial had a small sample of 46 participants and took place for four months, this was the most exciting news to take place since 1993. This is a great step in the right direction – but we are not done yet. We need to continue to educate medical professionals about HD and the impact it has on young people growing up in a family impacted by the disease. I am one of thousands of young people who have to learn how to cope with the disease. If medical professionals learn more from the patients, especially those both at-risk and those who have tested, it can continue to support the HD community as a whole. A lot of times, these diseases are diagnosed in older adults, who may already have a family and do not have to worry about their future. However, this is a new generation, better yet the future generation of the disease. When (not if) there is a cure or a treatment to slow down the disease, it will be up to the younger generation to get involved in trials and research. But rather than waiting until then, let’s start with today by having more dialogues between the medical professionals and the patients or future patients of the HD community. Two years after testing, my life hit a turning point. My senior year of college, the day before my last semester, my good friend, Jake, unexpectedly died in an accident. His favorite quote—he even had it in his yearbook—became inscribed on his headstone: “Live as if you were to die tomorrow, learn as if you were to live forever.” I thought to myself “How can I keep his memory alive by living my own life to the fullest.” A short time after that, I lost another friend, Meghan, who had a version of HD that took her life at the age of 26. Meghan had always shared her story to raise money and awareness for the disease. She never hid her disease, but instead used it to inspire others. It made me think more about my HD secret. Why keep going on in life keeping a part of me hidden from the world? Despite Jake and Meghan’s circumstances, their positive outlook on life inspired me. I decided it was time to tell my dad, my sister, and the world about my test results and the impact HD has on young people. After telling my dad and sister, along with others, I realized the importance of having as many resources as possible when going through the testing process. Not long after telling my dad and sister, I got a tattoo that said, “Live as if you were to die tomorrow, learn as if you were to live forever.” It is my constant reminder that life’s way too short and to take nothing for granted. Instead of letting HD define and defeat me, I found ways to use my disease to improve my life and the lives of others. Over the past couple years, I’ve met people I never would have met, been involved in organizations I never would have helped, and had experiences that my hidden-HD Seth never would have had the opportunity to enjoy. I sit on the Board of Trustees for the Huntington’s Disease Youth Organization (HDYO), whose mission is to support young people around the world impacted by HD. The past couple of years, I’ve been able to help out at the HDYO Youth Camp and actively and intimately help young people affected by HD learn how to make their life better as well. In January 2018, I was invited to speak at TEDxNatick and share my HD story to inspire others. It was an unbelievable opportunity to meet and listen to so many other people’s experiences. That talk made me realize that not only can my story help others learn more about HD but can inspire others who face challenging circumstances in life. Although I have my bad days, I remind myself that each day is a new day and to take life one day at a time. What’s your next step to a better tomorrow going to be? Previous What did Dinosaur DNA look like? Whatever happened to the Alzheimer's vaccine?